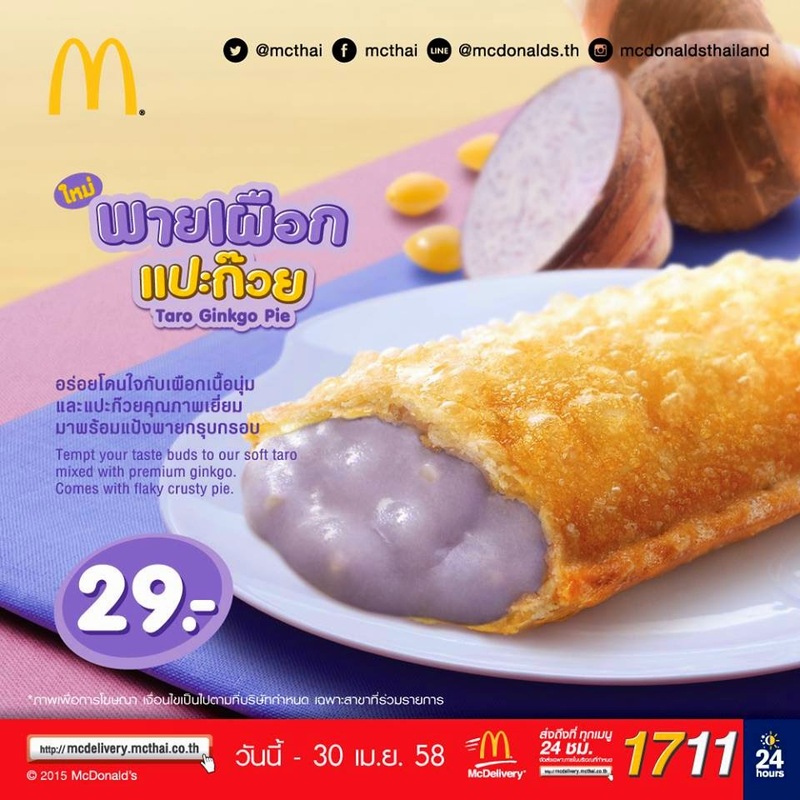 To those readers not based in Asia the thought of a Taro Ginkgo Pie from McDonald's might seem out of this world. In fact Taro Pies are actually a common promotional item throughout Asia, the first time I ran into one was in China in 2006, and I've also spotted them in Hong Kong, Taiwan, Malaysia, Thailand and Singapore. Since I had them once or twice before, I never bothered to try them again since I've been writing this blog. I run into the Taro Pie just as often as the Red Bean Pie, but I caved in an tried that again last year. When I visited Thailand a couple weeks ago, I encountered their new Taro + Ginkgo Pie which I felt finally was worth doing a new review. Now, I guess it's entirely possible that some readers will have no idea what either ingredient is, so to explain briefly, Taro is a root vegetable which has a starchy, almost potato-like consistency. The pie was filled with taro paste, and it's what give it the purple colour you see in the photos. Although it's pretty starchy, it has the sweetness of a yam, and even though I'm generally not a fan of the fried pies, it was a decent contrast with the oily outer shell. Even though I usually enjoy Thai promo pies which are savoury rather than sweet, this one was better than I expected. Taro chips (both potato chips or fries) are definitely something worth trying, you'll find them throughout South East Asia. Ginkgo is becoming popular in western countries because of it's health benefits, but you rarely find the bright yellow seeds served outside of Thailand where they are usually served boiled and topped with coconut and syrup as a nice dessert. Since the seeds need to be cooked, these inside the pie must have been boiled (or stored) in syrup as they were soft and very sweet. They didn't taste much different from the traditional Thai dessert, which is not much flavour at all. Whenever I have Ginkgo seed they always remind me a of a slight chestnut flavour, but The Wife always thinks I'm crazy for saying that. The Wife, and my mother were all trying this together with me (along with the Patongko Sticks). My mother probably hasn't had a fried McDonald's pie in over 20 years but she thought this was nice because of it's lack of sweetness to the filling, but she said this was a taste that would never sell well back in Canada. I felt the taro filling was better than I remember, but a bit on the watery side. It would have been nicer if it was a bit stickier, but they had the sweetness just right. The Ginkgo seeds were a very nice addition, and although there were only 5-6 scatted throughout the pie, they did add a distinct taste and texture I've never had in a McDonald's pie before. The Wife, always a fan of something fried enjoyed it as much as I expected.